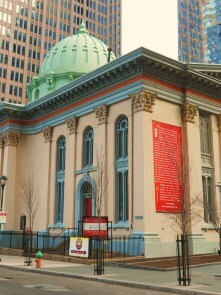 The present-day Arch Street Presbyterian Church is the result of a century’s worth of merging between five different congregations. 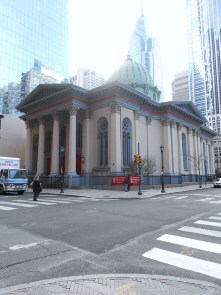 The first of these congregations, also located on Arch Street, was known as the Fifth Presbyterian Church and began in 1813. In 1816 the church was led by Dr. Thomas H. Skinner, who was known for voicing his stance against doctrinal preaching, leading to a threatened church heresy trial. While the threat was never put into action, the church gained a lot of attention and a lot of new members. Skinner left the congregation in 1832 to teach at Andover Seminary, resulting in to a devastating loss of congregants. A new pastor came on board to lead the church in 1836, but left by 1837, likely due to tension between old and new school Presbyterianism. After a tumultuous few decades, the church was reorganized as Arch Street Presbyterian Church in 1850 with Charles Wadsworth as pastor. Wadsworth was so successful in running the congregation and in preaching, that the sanctuary would fill up an hour before the service would start, prompting Wadsworth to enter the sanctuary through a trap door. By 1850 the church was ready for a new building to house the growing congregation. Construction on the new sanctuary, designed by Joseph Hoxie, came to a close by 1855 and seated a total of 1100 people. Membership at the church remained strong until the mid-1870s as the community surrounding the church began to shift from residential to commercial and industrial. 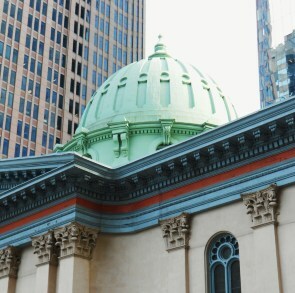 As the 19th century was coming to a close, the congregation merged with West Arch Street Church in 1897. Overtime, the new church began to encounter the same population shifts as the previous Arch Street Congregation. The city’s population continued to decline until the 1960s when the population of center city began to rebound. 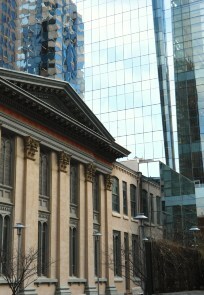 Today the Arch Street Presbyterian Church still stands proudly amidst a sea of glass and steel in center city.